While we waiting for Carrefour Promo pack, Jusco has got it ahead. The Promo Pack has arrived to most major Jusco outlets, which will available to public either today or tomorrow. Together with the 7 Designer's Challenge models, there are T-Hunt Plymouth and Lancer Evo X will keep you exciting. 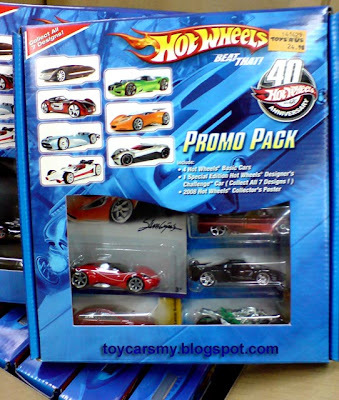 The Promo Pack is selling at retail price RM24.90. I wonder how many box of this promo pack did TKT bought?